Here in Northern California, two things happen at once: Huckleberries come ripe, and dove season opens. 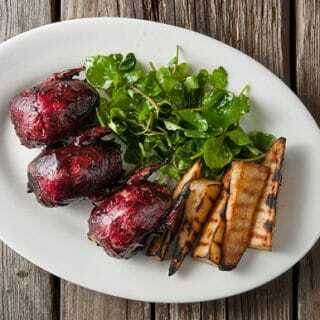 Combining the two, by making a huckleberry barbecue sauce to go with grilled doves, is a perfect Labor Day match. Grilling doves is the best way to cook them, bar none. Small birds need high heat to cook properly: You need temperatures in excess of 500°F to crisp the skin and still keep the meat pink inside. And yes, doves should be served medium. Think of them like steak or duck, only with little or no fat and much, much smaller. Can this recipe work with skinned dove breasts? I honestly don’t know. If you try it, I’d be grateful if you share your experience back in the comments section below. As for this barbecue sauce, it’s made of awesome. And huckleberries. I used evergreen huckleberries, Vaccinium ovatum, which are like purplish-black blueberries. You can use any huckleberries you want, or, if you live in the East, use blueberries. Even store-bought blueberries will work fine. Good luck everyone this dove season! May you hunt safely, shoot straight and eat well. 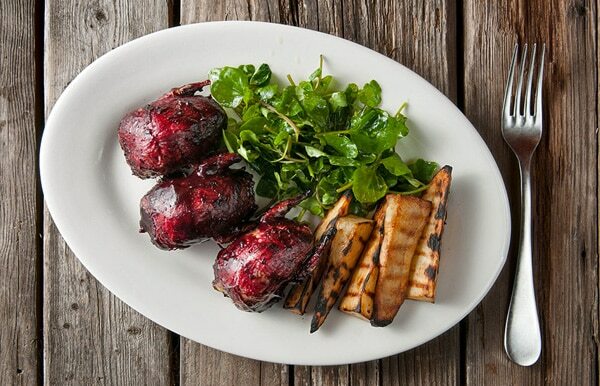 This is essentially a blueberry barbecue sauce recipe, as it is so easy to grill your doves. You will want to make the sauce first, as the doves take very little time to cook. Don't have doves? No problem. Try this sauce on pork, duck, squab or even chicken thighs. I think it's too intense for chicken breasts, though. The recipe below makes a lot of sauce, but the grilled doves are meant for 4 people as a main course. You will actually have enough sauce to coat a flock of doves, however, so you could conceivably serve 12-20 with this much sauce. Take the doves out of the fridge, salt them well and let them rest at room temperature while you make the sauce. To make the sauce, heat the butter in a pot over medium-high heat. Saute the onions for 2 minutes, then add the garlic and cook another minute. Mix in the remaining ingredients and simmer gently for 30 minutes, stirring occasionally. Turn off the heat and allow the sauce to cool a little. Pour it into a blender and puree. Be careful blending hot things, and keep your hand on the top of the blender; sometimes the steam can make it pop off. Wipe out the inside of the pot you cooked the sauce in and pour the pureed sauce back in. Keep warm over low heat. 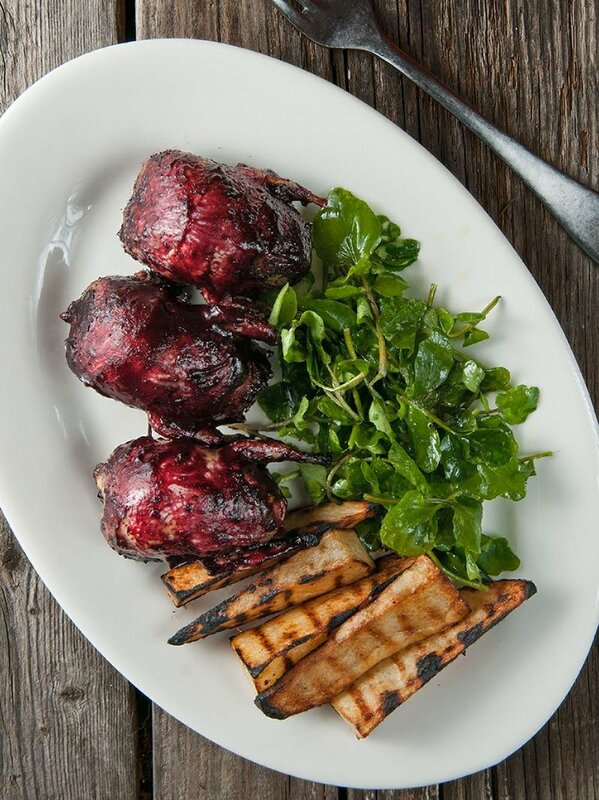 Coat the doves in the oil and get your grill fiercely hot. Grill the doves breast side up, with the cover down, over medium-high to high heat for 2 minutes. Lift the cover and paint them with the BBQ sauce. Cover the grill again and grill for another 8 to 10 minutes, depending on how well-done you like your doves. Remove to a platter and paint with a little more sauce. Let them rest for 5 minutes before eating. Stored in a glass jar in the fridge, this sauce will last a month or two. It is also acidic enough for you to can it in a boiling water bath. Seal it in pint jars and boil 15 minutes to seal. Made this recipe last night. Although (and don’t shoot me here) I did not make the sauce due to a lack of time so I used a locally made commercial barbecue sauce. Came out excellent! I promise next time to leave enough prep time to make the sauce. Yum! And enough sauce left over to do a couple more batches of 6. The sauce is awesome! & you’re right it’s great on pork too, (and I’m sure on anything else you’d normally put bbq sauce on).